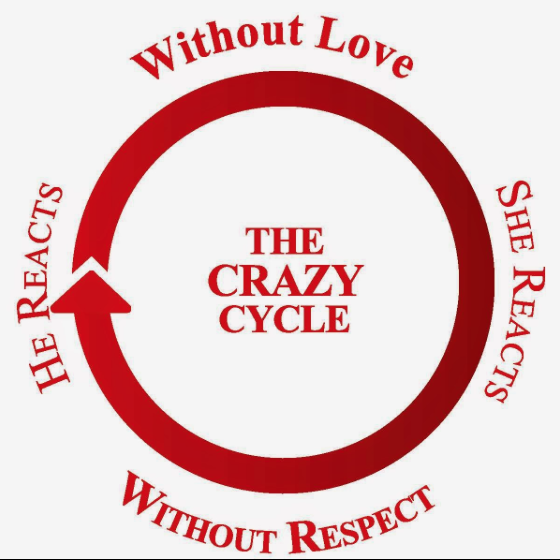 Is Your Marriage In The Crazy Cycle? Emerson and Sarah Eggerichs gave couples a wonderful picture of something that all couples experience at one time or another as they do life together forever. The Eggerichs believe that the symptom of couple’s most difficult challenges in marriage can be boiled down to what they call the Crazy Cycle. The Crazy Cycle happens because each spouse is not getting what they need, and in turn, are refusing to give what the other needs. According to the Eggerichs, what husbands and wives need is clearly defined in scripture. He needs to feel respected. When he feels disrespected, he has a natural tendency to react in ways that feel unloving to his wife. When he acts in unloving ways toward his wife, she is robbed of what she needs: love. She needs to feel loved. When she feels unloved, she has a natural tendency to react in ways that feel disrespectful to her husband. When she acts in disrespectful ways toward her husband, he is robbed of what he needs: respect. And the cycle self perpetuates. Stepping out of The Crazy Cycle requires great courage. It means doing everything you can to meet the needs of your spouse when you are not getting your needs met. Here are some basic steps to take to break The Crazy Cycle in your marriage. Pray – Invite God into The Crazy Cycle problem. Ask Him for strength and courage to take action to meet your spouse’s needs. Go First – Place the value of your marriage above how you feel at the moment. Humbly take action to meet your spouse’s needs. No Expectations – Take action without any quid pro quo. Do not expect anything different from your spouse. Hope for the best but keep your expectations low. Do what you need to do to break the cycle without any guarantee that it will work. Consistently Sustain Action – Stay with your approach for a few weeks to break the cycle. Do not try one moment or one day. Instead try a few weeks of sustained action meeting your spouse’s needs. Courageous Conversation – Use the Courageous Conversation rules to have a conversation about the needs that you have and how you would like for them to be met. Be open to hear how you can do the same for your spouse. Get Help If You Need It – If you cannot break the cycle, do not let it continue until your marriage is dissolved. Instead take decisive action to get professional help. You can call us for a referral at 281-949-8115 or visit with a local minister, marriage counselor or coach. We love to hear from readers. Have you ever found yourself in The Crazy Cycle with your spouse? What have you done to break the cycle? How do you show your husband that you respect him? How do you show your wife that you love her? What other suggestions you would add to this article? Do you know someone you need to forward this article to? I am in NW Arkansas now. Just had a conversation with a young couple yesterday about the “crazy cycle” they are in. I would add just one thing, but I think it’s important. Between 1. Pray and 2. Go First, I would put 1.1 and that is Repent of looking to your spouse to have your primary needs met and turn to God for that. Your relationship with God needs to become so preeminent that it seems like you “hate” your wife in comparison. The dogged pursuit of God and reception of His grace will allow you to submit more fully and willingly so that in Him you can Go First. Thanks for all you do for His Kingdom!! Thanks Chris. Appreciate hearing from you and thanks for your comment!